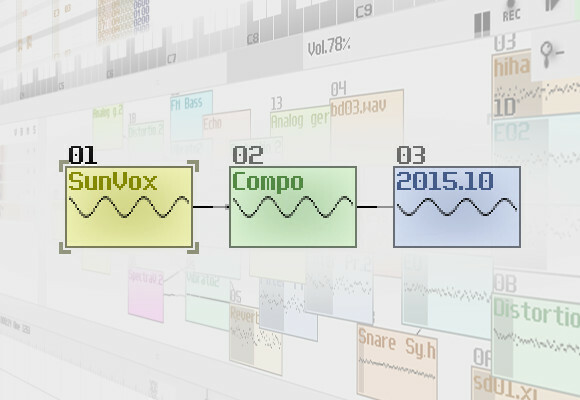 The new SunVox Compo is over! Congratulations to all competitors! Thank you very much for the great music! And thank you for using the SunVox! These works will be included to the SunVox distribution! KnyazIvan's piece is an especially worthy winner. Top marks from me! Haha, the scores at the top are so close! Well done everyone. Reasonable outcome, KnyazIvan certainly outdid himself, and echo2 was my other favorite song in the competition too! Congratulations! I'm mostly only surprised to see `A nos Amachi` where it is, I kinda like that song. Sounds classical-y. My song's position was very difficult because i was in just before a really big song "CarlosGecko - windy". While I'm not exactly KnyazIvan in my sound design (I don't know how you do it, man! ), I think what really hurt the song was exactly that Violin-Cello sample, it sounds very muddy/muffled in my opinion. i think it's dark electro ,i guess , isn't it ? * Or cyber ! , maybe ..